One of the main characteristics of content marketing is that it keeps up with all the current trends. It has become a way for companies to build their reputation and recognizable brand, but it has also become a bridge that connects companies and buyers. For content marketing to work in such a way and to make it efficient and productive, it’s necessary to understand its principles and to create a strategy that leads you towards the desired goal. 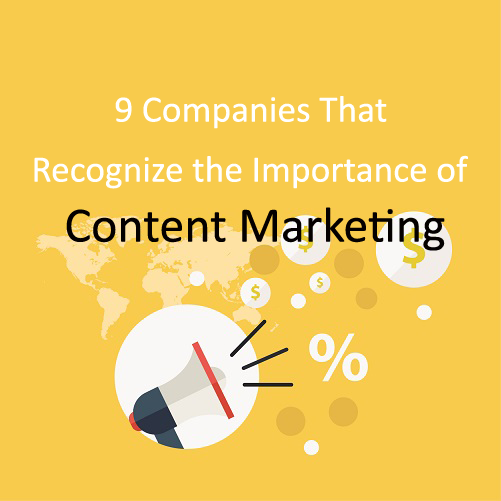 The following examples feature companies that have recognized the importance of content marketing and proven beyond doubt that it’s a strategy that does bring results. One might think there isn’t much content related to coffee, but Intelligentsia is a company that shows the opposite. What really sets them apart is precisely the content. Their strategy is all about creating useful content for their readers, aka, coffee lovers. So they focus on creating content their readers would expect and love to read. Their education section is full of stories that feature instructional materials and amazing photos. The main purpose of this content is to help their readers get answers to the questions they might be having about coffee. Secondly, this content is also a part of their iPhone app, which helps them engage mobile users as well. Finally, it’s something worth sharing on social media. This way, the company completely leverages the power of creative materials and uses them to maximize the exposure it gets online. Conclusion: Content represents a valuable asset to be shared with the users, but it can also be repurposed to target the app users, as well as social media users. Repurposing content is a perfect way to explore its potential on various platforms, targeting different groups of online users. 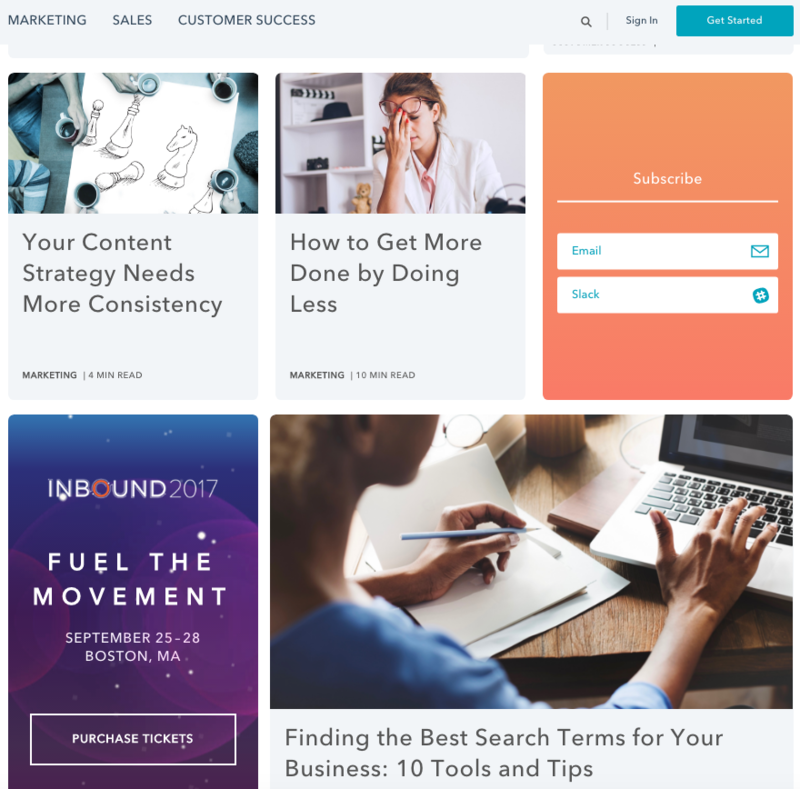 As a provider of inbound marketing and sales software, HubSpot has content marketing completely mastered. The content on the blog is super useful, allowing them to become absolute influencers in this field. Any question you have about online marketing, chances are HubSpot has the answer. The blog includes a lot of how-to articles, which are very helpful resources to learn from when it comes to online marketing. Other stories on the blog include inspirational ideas, major trends, and events happening in the online world that influence decision-making as well as planning new strategies. They optimize each post with a headline that is catchy and engaging. What helps them in generating leads so much are guides. These are very effective when it comes to converting the visitors. Not only do they represent an exclusive material, but they also provide lots of useful and practical information about a particular topic, becoming a sort of a handbook for all those who work in online marketing industry. Conclusion: Try creating and offering outstanding content to grow your mailing list. It’s a proven strategy that gets great results. One of the most famous brands known globally, Coca-Cola has been focused on making a special connection with its customers. Over the past years, the company has introduced several campaigns that were focused on consumers. They were trying to focus on allowing consumers to become a part of a creative process. First, they started with printing names on the cans and bottles. It made their product relatable and personalized in an instant. They went a step further when they enabled online users to contribute with creating custom labels. These labels featured names and titles for their products. Not only did the customers feel special, but they were also getting a unique product with a tag they could relate to. Of course, this experience transfers to social networks, where visual content has become the main asset in the company’s online marketing strategy. 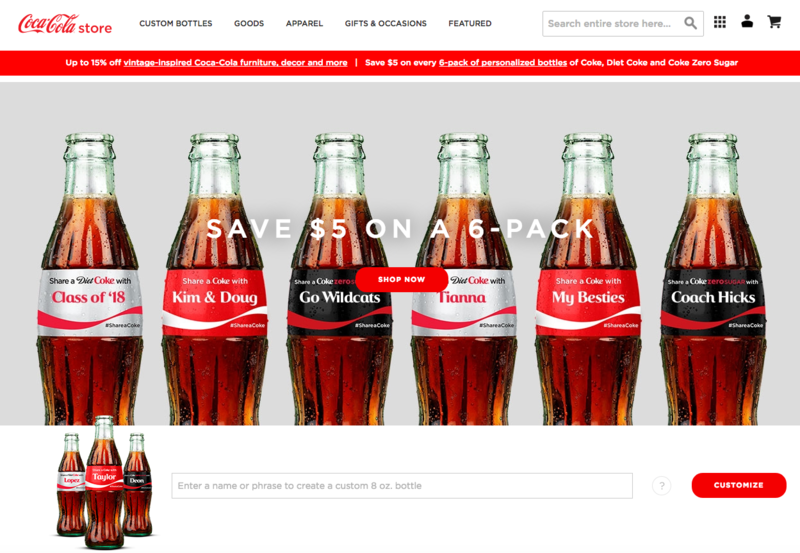 Users from all over the world started sharing their images and videos with Coca-Cola products and its custom labels in the center of attention. Conclusion: Make content that is personalized and relatable to improve your relationship with online users. Engage users to obtain feedback. It’s the customers who can help you grow your campaigns through shareable content materials. Marie Forleo is a life coach and motivational speaker who has been sharing video content on YouTube since 2011. Her content is inspirational and motivating. It helps solve dilemmas and issues her target audience has, with a dose of humor along the way. Her subscribers get access to exclusive content, which helps her keep growing her mailing list. Besides the outstanding content quality, her content strategy is also consistent. Every Tuesday you can expect an engaging email, inviting you to watch the new video. In each new episode, she talks about a particular problem or an issue about starting a business, running a business, staying motivated, etc. She’s also mastering content marketing through her own blog as well as email marketing. What really helped her become an influencer is her expertise in the topic, experience in starting an online business and ultimately a down-to-earth approach. She constantly reminds us that she is just another girl from New Jersey, who had a dream and went for it. The encouraging message behind – if I can do it, you can do it too. Conclusion: Try exploring different content formats, especially video, which has consistently been growing in popularity over the past years. Also, make sure you keep thinking about your target audience as you create content. Think about the way they feel, think and make decisions, to create content that helps them in the process. It’s generally known that entertaining content performs amazingly well on social media. However, there aren’t too many brands that recognize its true potential and even fewer that do it well. 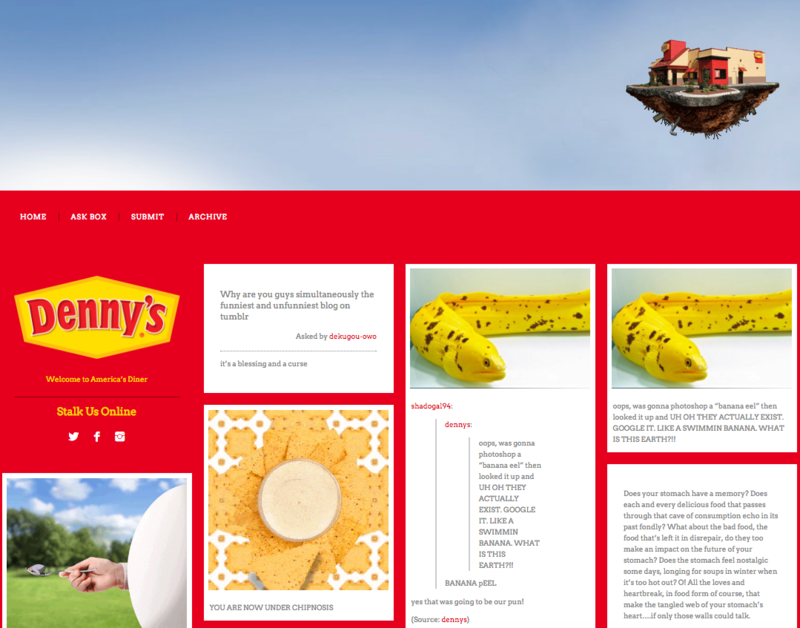 Denny’s is an American dinner which uses Tumblr blog to share amusing images, gifs and comments all designed to promote their brand and the concept they stand for. The content goes from funny to ridiculous or even weird, but the goal is to entertain, and they’re nailing it. Witty comments and interaction with the users are what helps them connect with their online community. The company is also being quite aware of its target group, so it remains loyal to this casual approach on Tumblr and Instagram, while their Facebook page keeps the lingo and content more ordinary. Conclusion: It’s always good to entertain your audience with interesting comments and content, but such content has to complete two goals. It needs to be in accordance with the brand impression you want to promote online. Also, it has to appeal to your target group. As a company that has been on the market for decades, IBM has successfully adapted to the digital world. Educational content, including the video format, is what helps them establish a relationship with potential customers and generate leads. They have also been collaborating with industry leaders on projects to gain even more exposure. 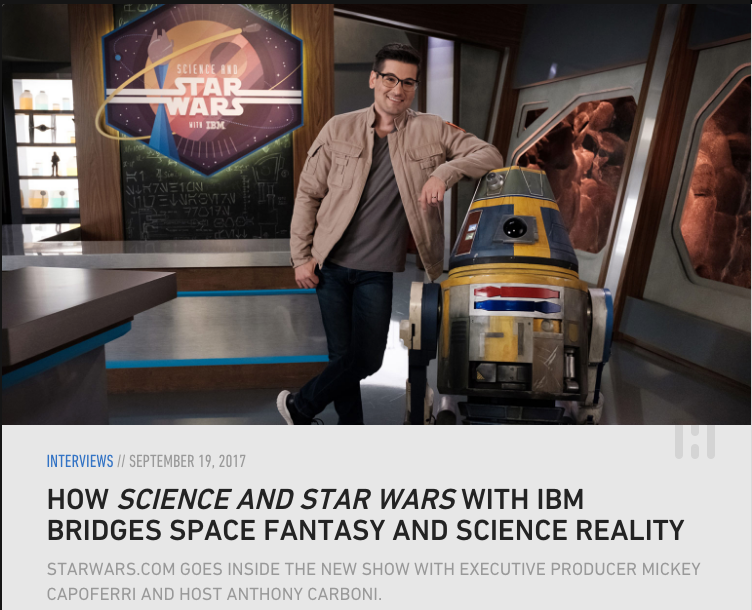 Their latest collaboration with Science and Star Wars TV show is another way the company uses global trends, joint projects and knowledge to create engaging content that targets more than their usual target group. In this show, they bring experts, do experiments and, most importantly, have fun. Conclusion: Your own experience and knowledge can help you a lot with creating new content and deciding where you want the content marketing strategy to take you. Collaborations with content creators are an incredible opportunity to increase reach. Additionally, these collaborations also help you expand the content to include opinions or recommendations from other experts. E-commerce businesses are sometimes so focused on the actual buying process and optimization of product pages that they fail at recognizing the potential of content marketing. 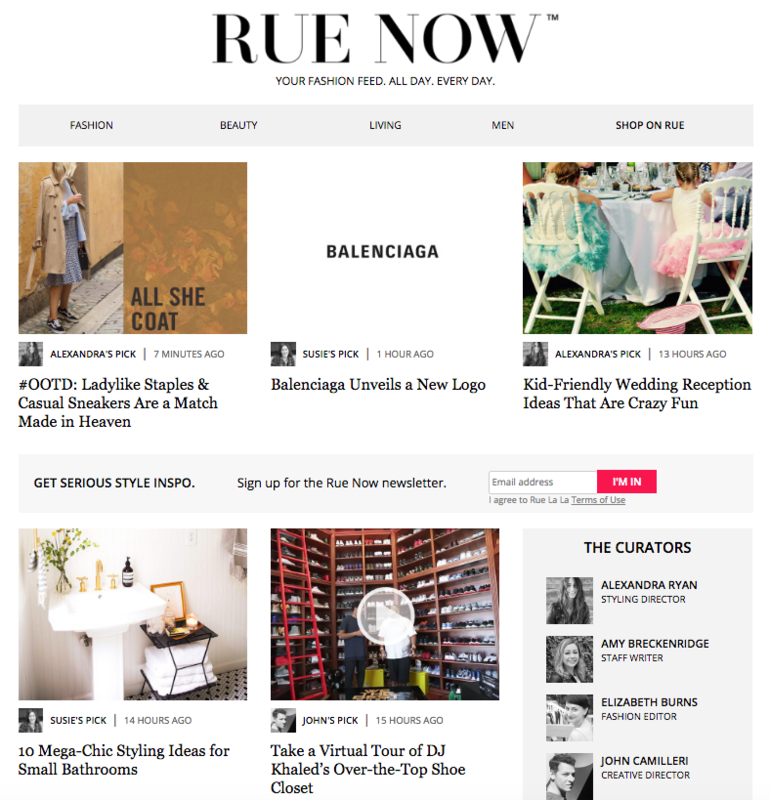 Rue La La, an online clothing store, combines fashion inspiration with shopping in a regularly updated blog. It’s called a fashion feed and it features numerous topics their potential customers would generally be interested in. Not only does this content help the company connect with its customers, but it also helps them with providing lots of great content for visitors to share through their social media channels. This way, they also maintain an active presence on social media which is yet another platform that allows them to connect and engage the (potential) customers. Useful content is a non-intrusive way to convert the visitors into customers. It relies on the approach free from advertising and promotional content. Their primary goal is to help and educate their target group. They’re doing an amazing job by keeping the blog regularly updated, filled with fresh new trends, tips, and advice. Conclusion: Using content instead of promotional messages allows you to convert customers based on your content quality and by making them genuinely interested in your brand. With the increasingly large amount of advertising messages all over the internet, content marketing becomes a non-intrusive alternative. Instead of promoting your products directly, try increasing the interest in your company/brand. 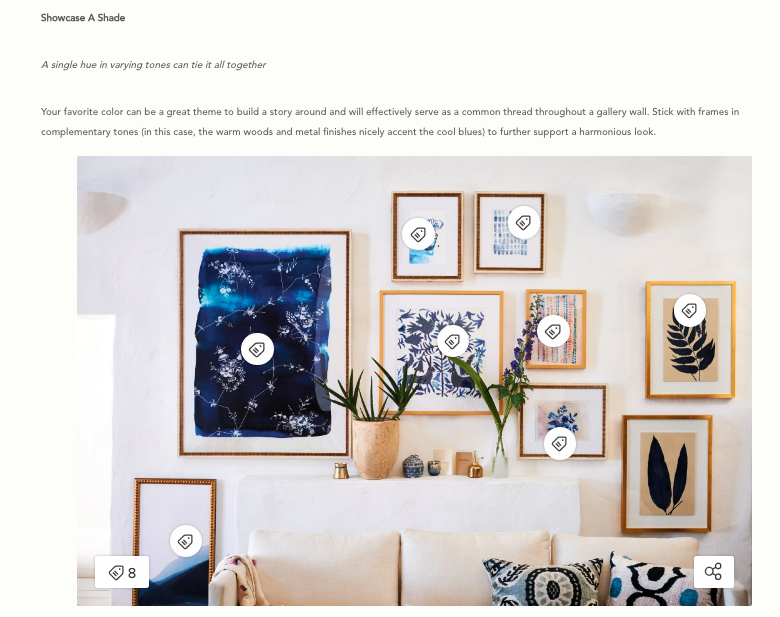 Being another e-commerce website that has recognized the importance of content, Anthropologie seems to go a step further. A lifestyle blog features stories about decor, travel, style, DIY, etc. The engaging content is accompanied by a lot of beautiful images, some of which feature the company’s products. What is interesting about their content is how they connect it directly to the store. You won’t find any links scattered around the text. Their approach is subtle and more sophisticated, the values they, as a brand, promote. Once you hover over an image, you will see the tags for the products you can buy. When you spot an item you like, just click on the tag. It will take you to the product page. Pretty cool feature. And extremely user-friendly. They heavily promote blog content on social media, on Facebook and Twitter in particular. When it comes to Instagram, the company has another approach. Sharing content published by other influencers featuring their products allows them to increase their reach. Yet, they are consistently sharing new and original content. The link in the profile directly leads you to the page where you can buy a particular product. This is another way to integrate shopping aspect into the content. Conclusion: Putting content in the spotlight is extremely important, but it is necessary to link this content with your business goals, regardless if that is a sale, lead generation, etc. This way, you can directly analyze the performance of content marketing and how it reflects on achieving your goals. 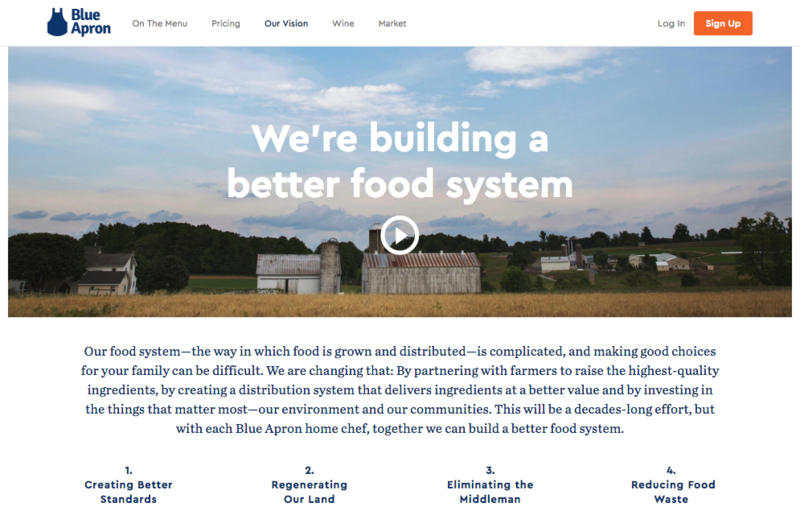 This company represents a connection between farmers and customers who are getting high-quality ingredients when they subscribe to the service. The service they provide is not unique. Still, what has really helped them stand out is the content, more importantly, storytelling. The vision of the company tells an engaging story about what the company stands for and what their mission is – to reduce food waste and deliver fresh ingredients to their clients. The blog is where you’ll find lots of food tips and recipes, as well as how-to and instructional articles, that will teach you about best ingredients and how to use them properly when cooking. Conclusion: Storytelling is an incredible way to appeal to the emotions of your audience through content that will surely make a difference. This strategy is a very effective approach to content creation in online marketing. What we can learn from all these examples is that there is much more to the content than the actual words (or images/videos) and content optimization. To make your content work for you, to help you overtake the spotlight, you need to think beyond. Think about the target group, your business goals, how to create a user-friendly experience, to educate and entertain. Eventually, think how to get the online users interested in your brand and your products (or services). Use the experience from these brands to explore all of the different aspects of content marketing to be able to leverage its full potential and maximize the results obtained through this marketing strategy.